Is there a Fry's Electronics near you? Click here for a Fry's Special Offer! click here for our new PRO pages. or another computer in your office? Contact us at 800-944-1838 to purchase a second copy for 80% off. for auto dealers or entrepreneurs. ©2002-2010 Credit-Aid Software. All rights reserved. Reproduction, adaptation, or translation of this document without prior written permission is prohibited and is protected under the copyright laws. Credit-Aid Software is a registered trademark of Daniel Rosen Inc. All other trademarks are the property of their respective owners. Windows® is a registered trademark of Microsoft Corporation in the United States and other countries. Credit-Aid Software is licensed to install on one (1) computer. All sales are final unless otherwise stated in terms and conditions. Credit-Aid™ Software's intended use is to help automate the process of cleaning up your credit history reports. 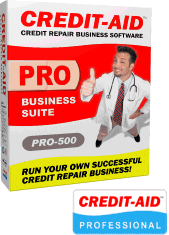 Credit Doctor Software gives Credit Information, not legal advice. For questions about specific issues regarding your credit, please consult an attorney. "This software is awesome and very easy to use. I raised my credit score 237 points and saved thousands on my home loan! I've already recommended it to friends. Thank you." "I was able to remove errors on my credit reports. My credit score was corrected so I was able to purchase my home and qualify for a home loan thanks to Credit-Aid. I would recommend this to anyone having problems getting their home refinanced or anyone who wants to raise their credit score." If your credit score does not improve in 90 days we will refund 100% of your purchase price. To receive this refund, please provide us with your order number, receipt of purchase, plus credit reports and scores from all three bureaus (dated before and after 90 days). Our 30 Day Product Guarantee We believe in our products and we know you will love them, too. Our software support team is available to assist you and will generally reply to any concern within 24 hours. If, however, they are unable to resolve your technical issues we will offer a full refund, within 30 days of purchase. In the unlikely event that you experience any difficulties whatsoever with Credit Aid, our support team wants to hear from you. The software has been triple quality assurance checked at every level. It is being used and enjoyed by thousands of happy customers. We are confident that it is stable and will function trouble free on any computer running windows 7, Vista or XP. Buy with Confidence! If you are a mortgage, real estate, auto or credit professional wanting to repair your clients credit, our "home-user" version will not be useful to you. We offer "limited feature / limited use" versions of our software for "home-users" at a consumer-level price. "Home-user" versions only allow 3 names. You cannot add more names, you cannot delete them. There is no way to track more than 3 clients and you will not have the necessary paperwork needed to help your clients. Pro users who try to run a business with the home version will have no pro support. "Home-user" versions are only for home-users. If you have questions or would like a free consulation. please call toll-free 800-944-1838 or use our LivePERSON Chat.